eBay SHIPPING: •Shipping by USPS Priority Mail. •Offer delivery with Tracking Number. •Need 1 business day for Handing & Packing. 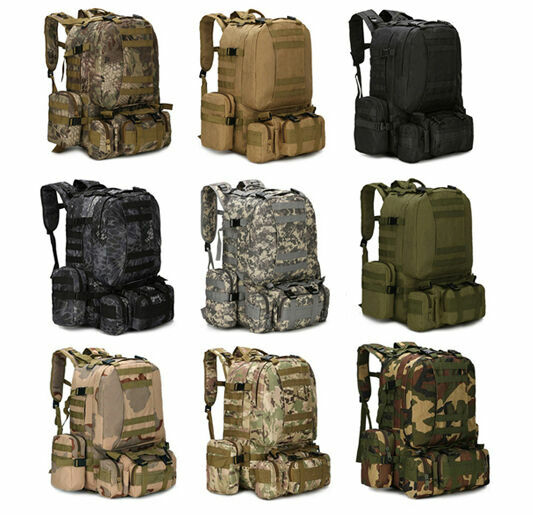 •Package will arrive in 2-6 days for 48 contiguous states without weekend and holiday.Features:• Capacity: 55L.• Molle design, molle belt on the front and two sides.• Wide & thick waist belt, comfortable for heavy carry.• Materials: waterproof anti tear advanced 600D Nrlon.• Come with a hand carry strap and adjustable shoulder strap.• With 3 detachable molle pouches attached on front and two sides.• Dimensions: Width: Side Pocket: 10"H x 7"W x 2"D.Front Pocket:13"H x 8"W x 4"D.Main Compartment: 23"H x 20"W x 6"D. Please Click below pictures if you are interested in other products.